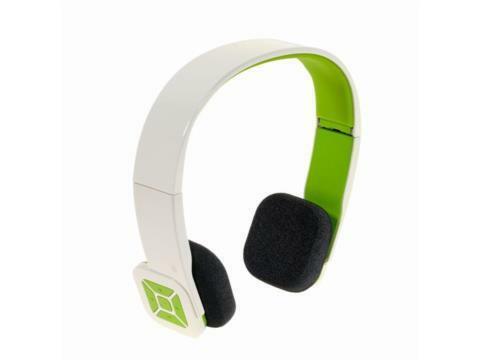 Coming in a variety of colors, for sure this headset will appeal to both adults and youths. Eagle Tech Computers, Inc., a company based in Chino, California, is a manufacturer of computer peripherals and accessories since 2003 and today we get to try one of their Arion line of products, the ARHP200BF Bluetooth Headset. Foldable and wireless through Bluetooth technology the Arion ARHP200BF (from now on and for simplicity the 200BF) headsets (Amazon, $40.95; Newegg, promotional $29.99) have a colorful although minimalist design. Built in plastic and steel extensions, they are a no brainer: they simply work. More on that later. As far as accessories go they are shipped with a carrying case, USB cable and a user manual. 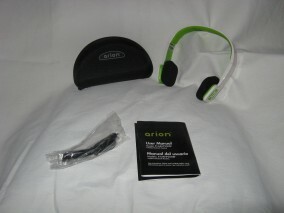 The Arion headset comes in two sets of colors–black over orange, red or yellow; white over grey, green or pink–for a total of six different models. The sponges covering the speakers are black squares no matter what color combination and sit vertically on your ears. On the right side you have a 5-button control pad: up and down volume; next and back; and at the center a multi-use button. With it you can turn on the headset and pair it up. Also you use it to pick up a call or to decline it and to hang-up; you can also use it to play and pause an audio track. On the left side you have a battery check button and LED indicators: press it and four or less LEDs (depending on how much charge the headset has left) will lit-up. Additionally, your iPhone will show a little battery indicator next to the BT icon. The device comes with a USB cable to charge it but no power adapter, nevertheless the manual is specific when saying that it requires 5 volts of direct current at 160mAh. You can extend the 200BF’s metallic arms to adjust it to your head. They fit snugly, so for some people it may feel a bit tight. The setup is very easy, as long as you follow the instructions and press the buttons GENTLY. And here I found another issue with this model; the buttons seem sturdy but when pressing you can feel that the mechanics inside are not so much. The 200BF does in fact as advertised, you can use your phone and plays audio files remotely, although on this regard the manual is clear in that the device holding your media files must support the AVCRP profile. I could even walk around my apartment loosing signal only after being about 28 feet away and two walls in between. For a Bluetooth device the audio is pretty good although no much bass depth, provided you care for it. And of course, there’s no noise cancellation, so if you give them to your child you know she’s ignoring you when talking to her. Generally speaking other users have had a good experience with this headset. The box advertises it as compatible for Apple devices, but they also work with Android devices that are Bluetooth capable. The ARHP200BF headset is a good device with solid performance despite its shortcomings. Sound purists should look somewhere else. Watch the slideshow to take a closer look. PROS: It works with Bluetooth, including iOS and Android devices. Good battery life. CONS: No A/C power adapter.